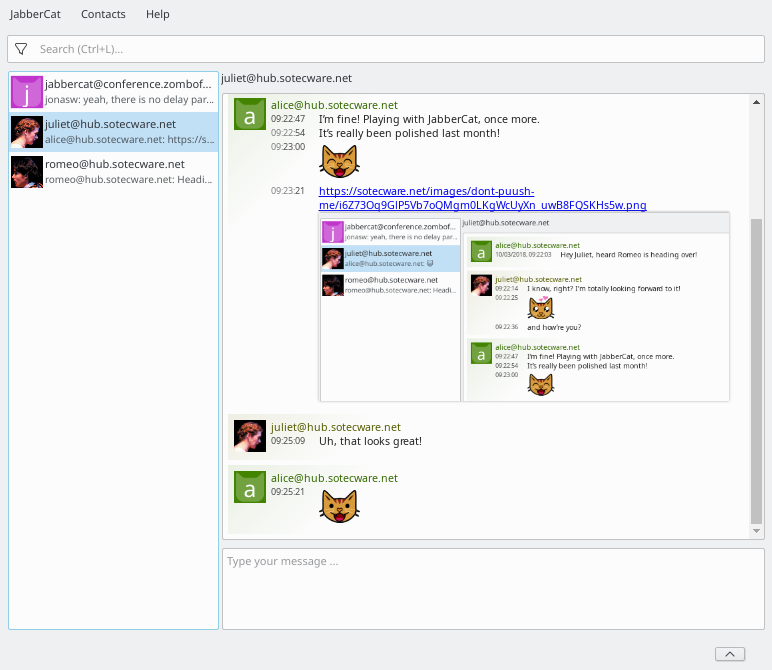 JabberCat is an instant messenger which uses the long-established Jabber network (based on XMPP). It is written in Python using Qt 5. This page will at some point become a nice entry page. However, at the current state of development, we prefer to invest manpower into actual features and polishing the app itself. We hope you understand 😺. We suggest that you head over to the Testing Guide now. Contact the lead developer via Jabber: jonas@wielicki.name. Note: Add them to your contacts first. See our repository at GitHub. The screenshot features content licensed under CC-BY-2.0: Romeo & Juliet.